In the second part of the perfect children’s bedroom, we bake a cake – not literally you understand! It’s really a matter of putting certain ingredients together to give you a good foundation to build on. The trimmings are all the things that you can change over the years and won’t cost too much to do. Get the basics right and a child’s room will grow up with them. See our Perfect Children’s Room – part 1 here if you missed it. Spend some time thinking about this; it’s important to think of texture and colour. Children spend an awful lot of time playing on the floor, so it needs to be practical and hard wearing. Hardwood floors are great, but will need some softening effect, with a rug or something similar. A carpet is also a good idea, unless your child suffers from allergies, if so, stick to wooden flooring. A hardwearing carpet is great, it softens the room, keeps the area warm to naked feet and is non-slip – keep to the lighter colours of the spectrum as opposed to very dark ones when fluff and dirt will show, but don’t make it beige or white! That might be too hard to keep clean! BAKING A CAKE FOR DIFFERENT OCCASIONS! Colour scheme – harmonious and complementary always works well. Use 2 colours, one for the walls and another for the skirting, door and window surround. Make sure they complement each other, and if you want to use a striking colour, confine it to one wall - an accent is a great way to introduce a bit of fun into a scheme. 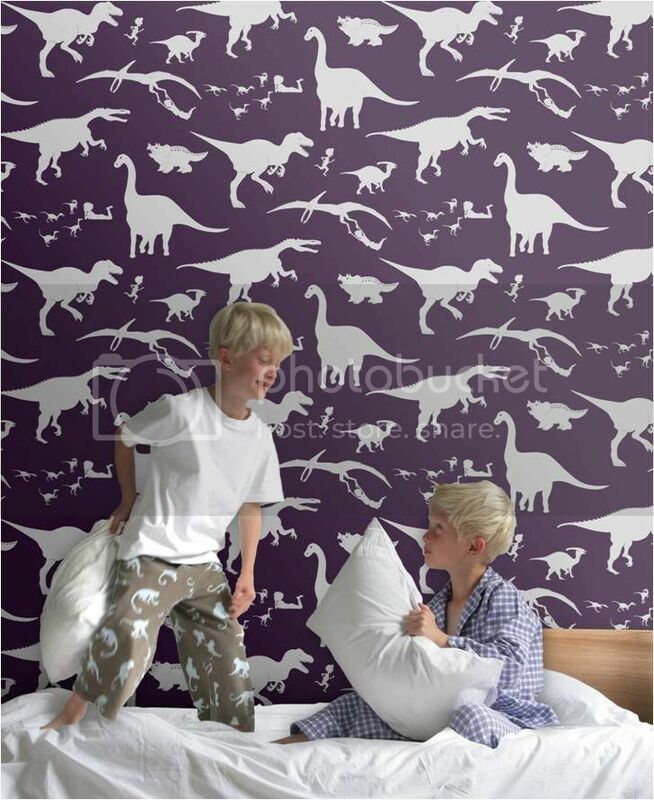 A different way of introducing a bit of variety into a child’s bedroom is wallpapering one wall with a suitable design. After all, what small boy doesn’t like dinosaurs?! We found a host of great graphics at www.paperboywallpaper.co.uk, a UK based company started by Victoria Cramsie a few years ago. The designs are bang-up-to-date, contemporary but with a nod towards classical themes. We particularly love this one (on right), ‘Dya-think-e-saurus’, available in purple and silver, blue and brown as well as green and red, because it’s infused with a sense of danger and adventure; exactly what small boys love! The paper comes from accredited sustainable forests (FSC) and they are made in Norfolk. 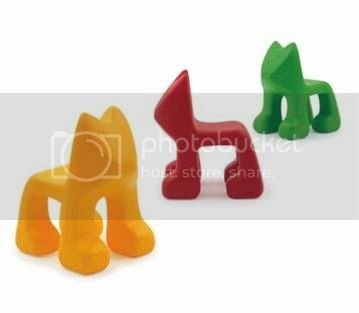 For an instant injection of colour and fun try these smaller chairs that are toy-like from http://design-conscious.co.uk. The Julian chairs, as they are known, are part of the Magis collection designed by Spanish designer Javier Mariscal. Available in a choice of colours, they are light-weight and can be used outdoors. It is always good to have things that can be easily and safely dragged outside when the weather gets better! Another fun addition are these Sway stools. 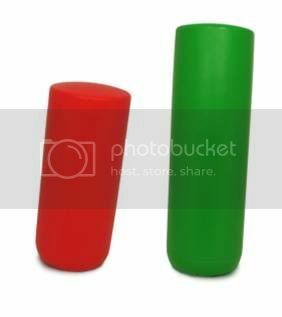 Filled with sand as ballast, they come in Red, Orange and Green (plus Pink as special order!). Available from http://www.gardenbeet.com, an eco garden accessories & gifts shop, the stools can also be used outdoors. These stools will be shown at the V&A‘s Museum of Childhood exhibition (6th Feb-13 June 2010) called ‘Sit down: seating for children’. Children’s rooms are their private space, a place to take refuge from grown-ups and the world. The need a space that makes them feel safe and happy. So decorate their rooms with thought and care. Don’t buy child-sized furniture for the whole room - it will date and the children grow so quickly that normal sized furniture is a much better longer term investment – in any case, children always want to grow up faster don’t they? Having adult furniture will make them feel special. Obviously a cot and changing table is required where the room is for a baby, but the rest of the room furniture, if chosen well, can last until adulthood. You can always buy the odd smaller items like the Julian chairs (see above), to brighten up the room, but we wouldn’t suggest the whole room is furnished in this way. Children love bunk-beds, so it might be a good idea to invest in these, even if there is only one child, it makes it so easy when their friends come and stay. They offer such versatility and space saving, they are invaluable. If the space is really small, you might still consider a bunk bed without a bed underneath, but replaced with a desk and storage space. The variety of bunk-beds available at www.steens.dk, see picture, range from the traditional to the more contemporary. Think long-term investment, so buy adaptable furniture that in time can be painted if need be, and re-used for other purposes. A baby changing table could be re-used as a chest of drawers, a toy box can become a blanket chest or used for linen storage – painted and even upholstered still means a minimal outlay for a totally new look. These are easy to follow tips and ideas and they will ensure that your children’s bedroom will stand the test of time….and not break the bank!